These plants and charcoal metallic finished containers tie in nicely with the marble flooring here. The overhead lighting adds drama and flair to the look. 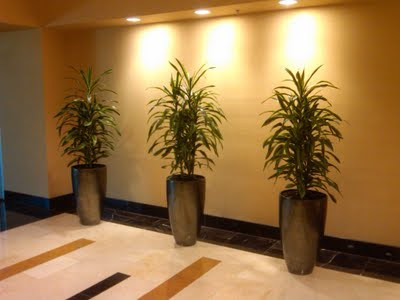 Check out how these plants bring this auto showroom to life. In the foreground we have a living plant arrangement in a an Eco friendly fiberglass container from Architectural Supplements. It is their Earth Bowl line EBL-1808 in Gunmetal Gray color. In the backround is a large Ficus Lyrata in a classic cylinder shaped container from Architectural Supplements European Collection.